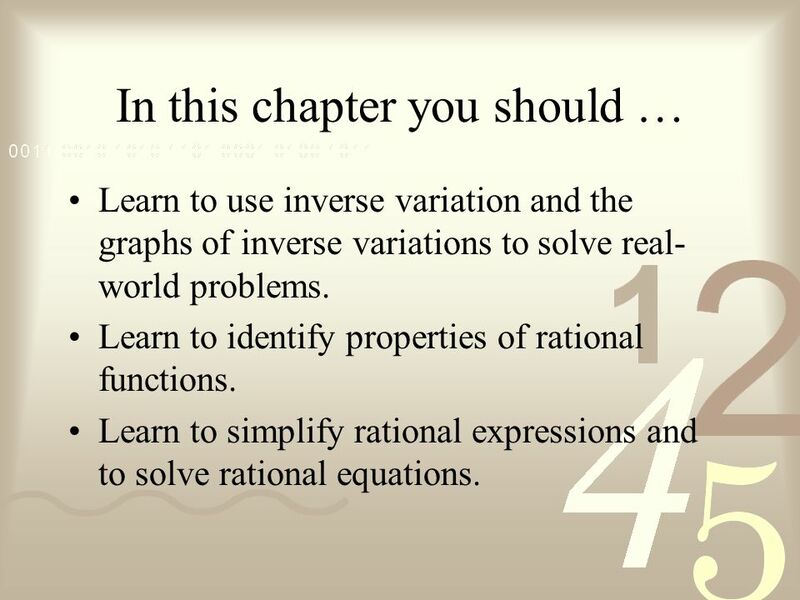 Learn to use inverse variation and the graphs of inverse variations to solve real-world problems. 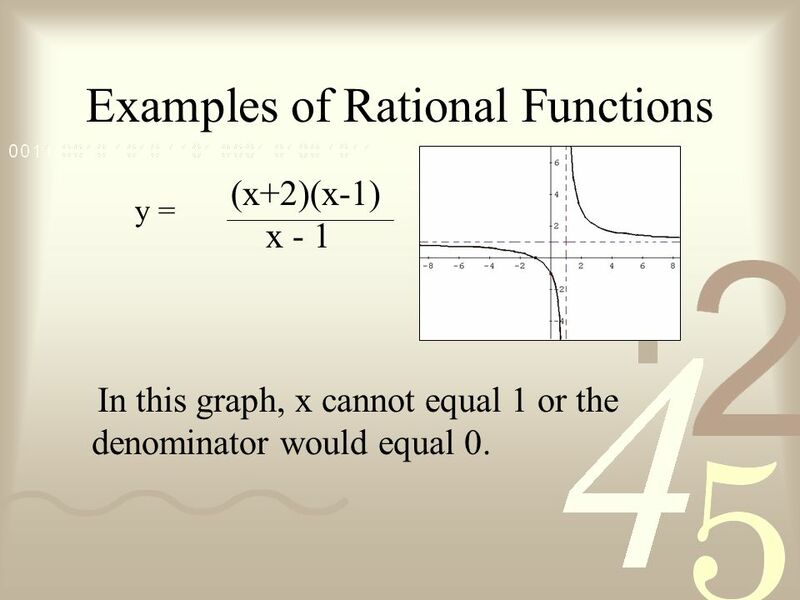 Learn to identify properties of rational functions. 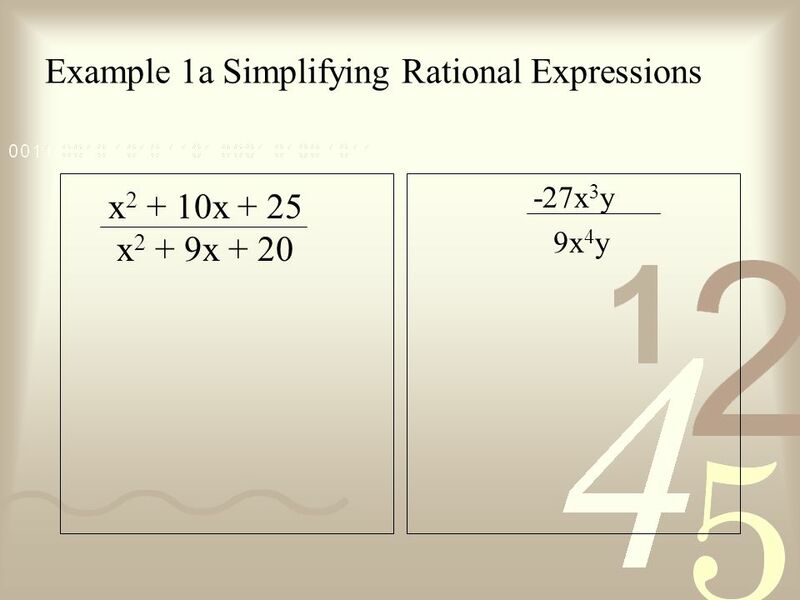 Learn to simplify rational expressions and to solve rational equations. 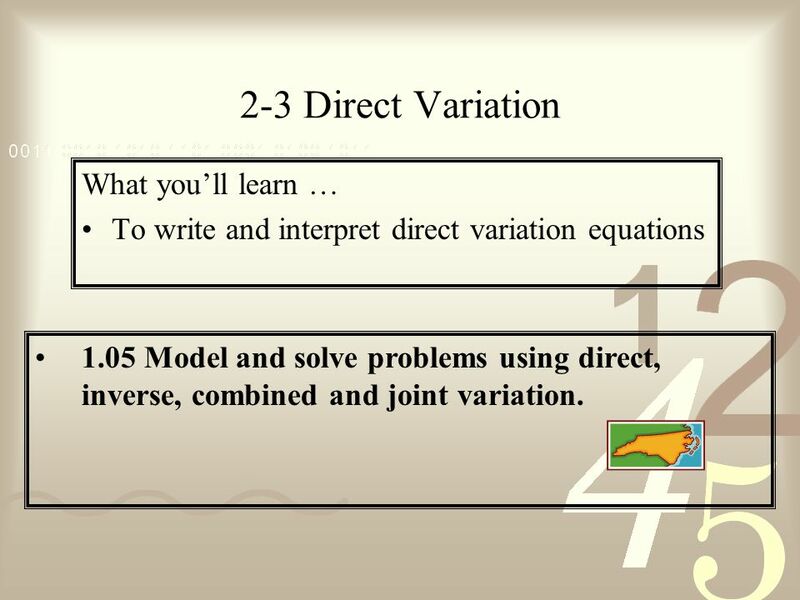 To write and interpret direct variation equations 1.05 Model and solve problems using direct, inverse, combined and joint variation. 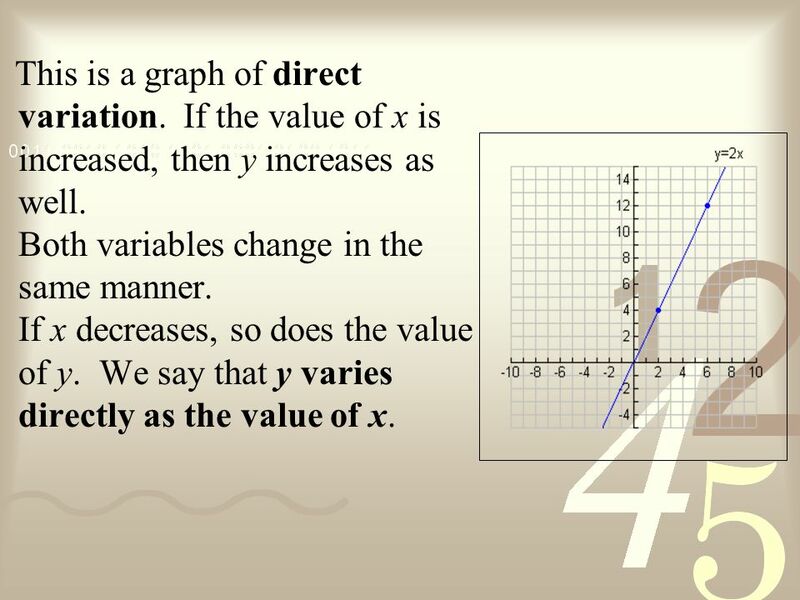 This is a graph of direct variation. 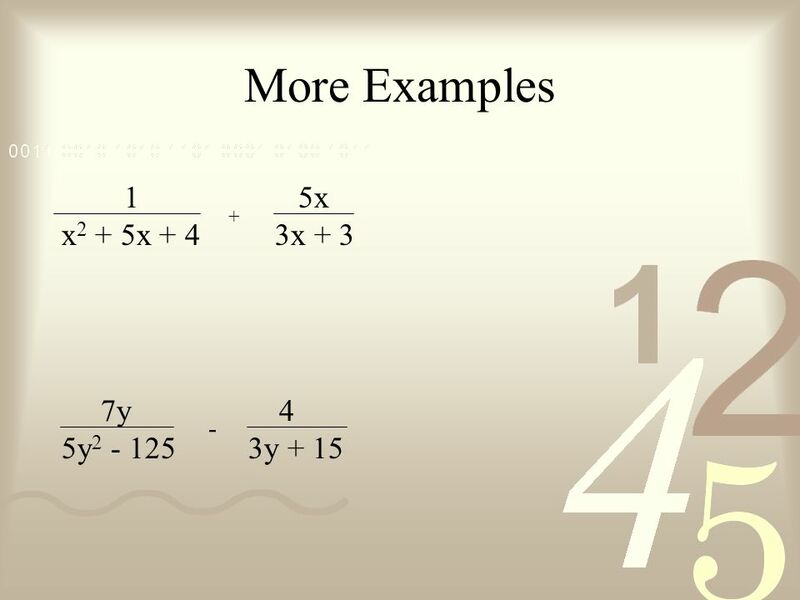 If the value of x is increased, then y increases as well. 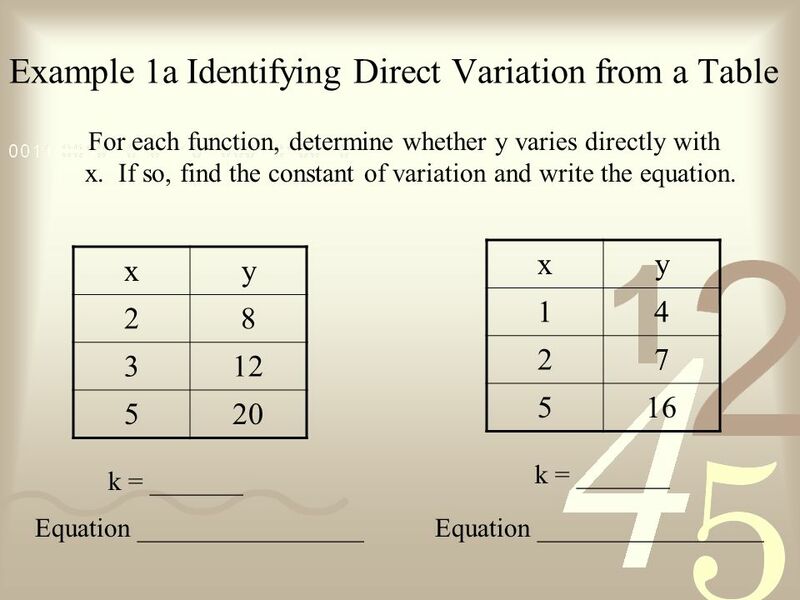 Both variables change in the same manner. 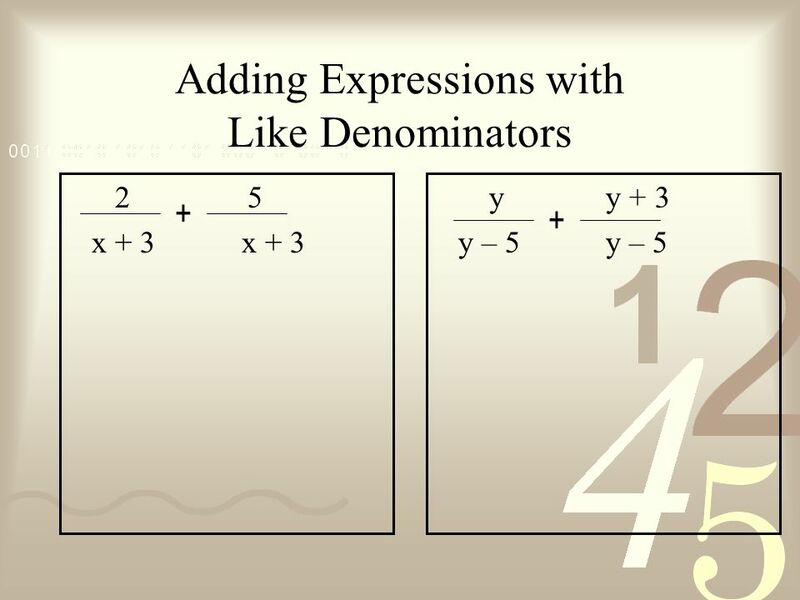 If x decreases, so does the value of y. 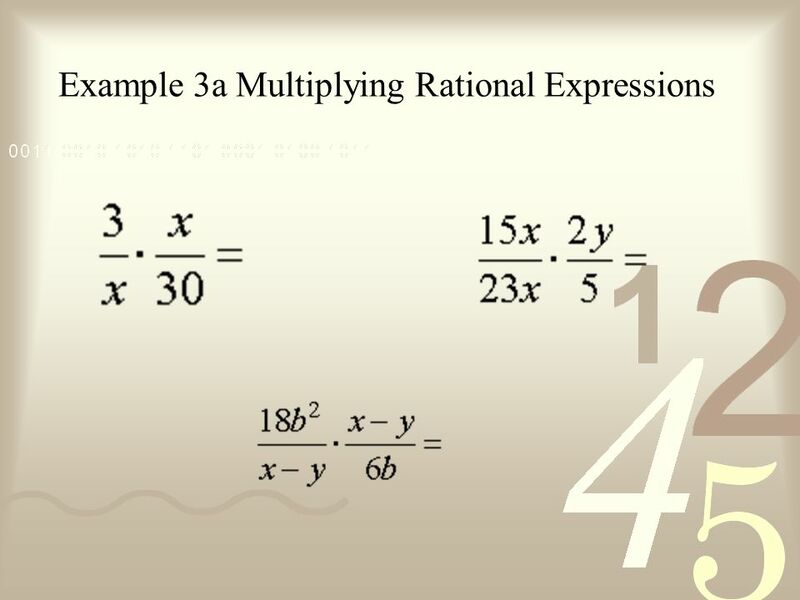 We say that y varies directly as the value of x. Suppose y varies directly with x, and x = 27 when y = Find x when y = -17. 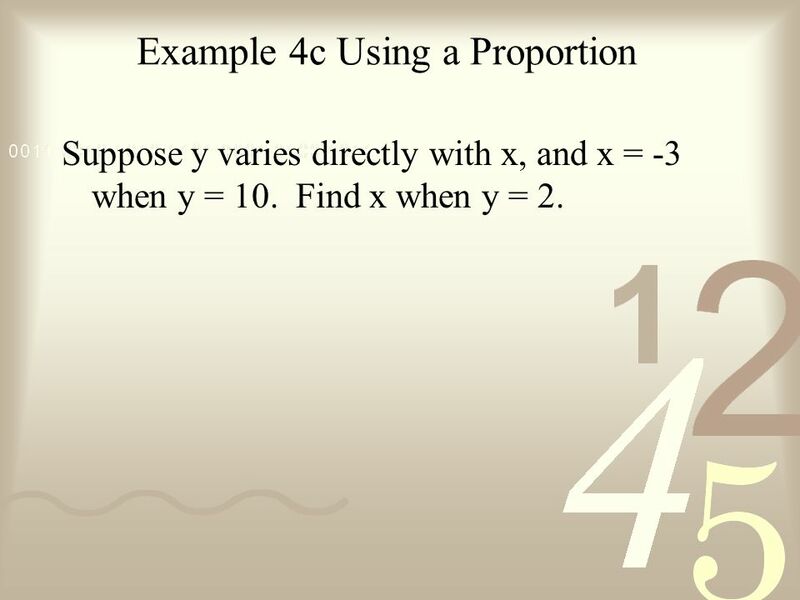 Suppose y varies directly with x, and x = 3 when y = 4. 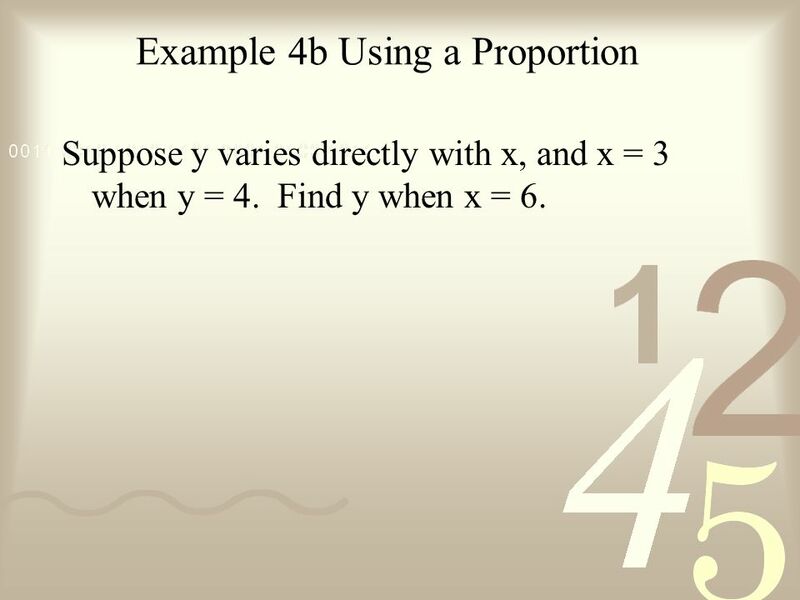 Find y when x = 6. 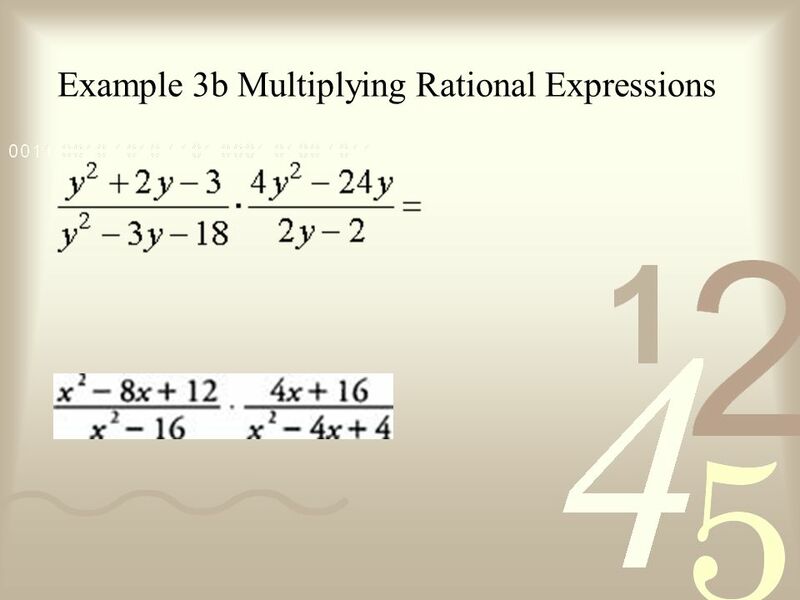 Suppose y varies directly with x, and x = -3 when y = 10. 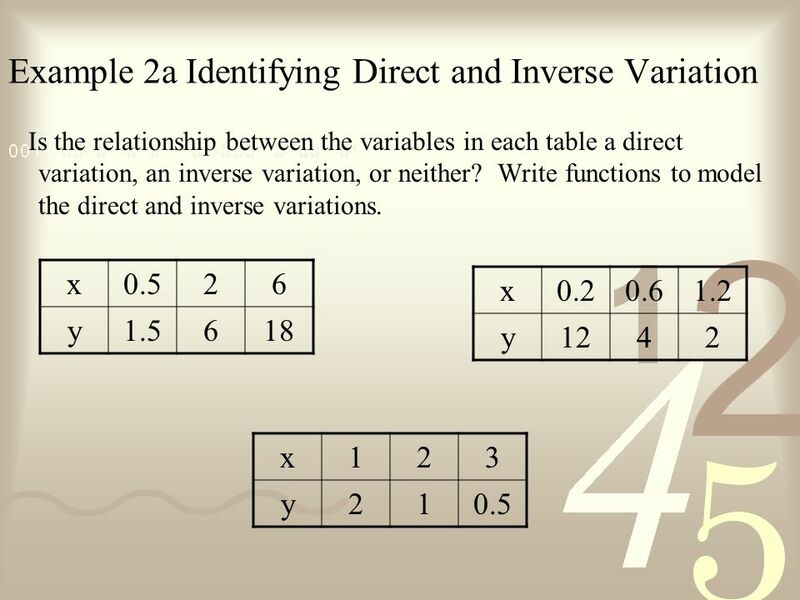 Find x when y = 2. 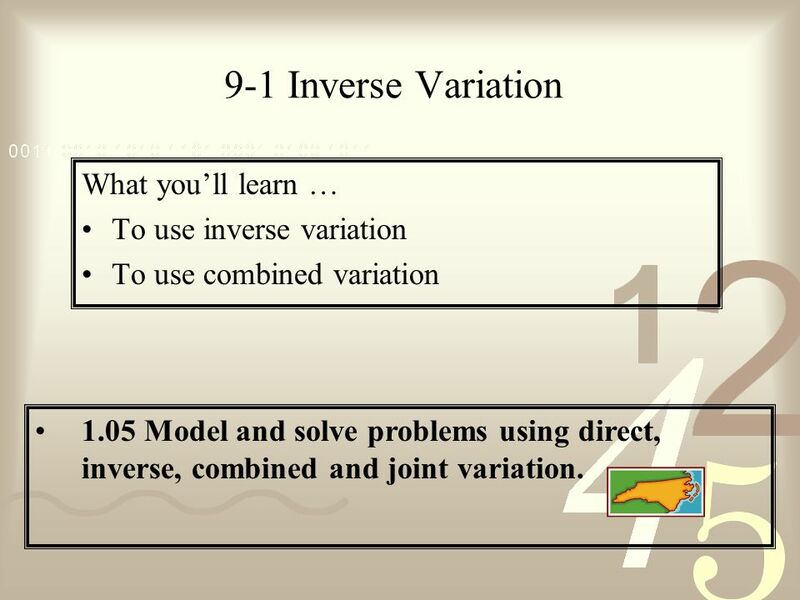 To use combined variation 1.05 Model and solve problems using direct, inverse, combined and joint variation. 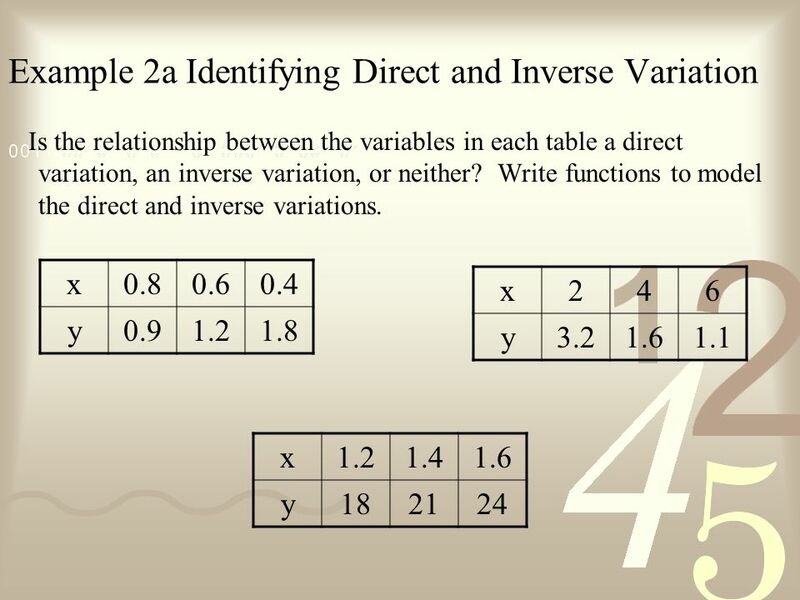 12 In an inverse variation, the values of the two variables change in an opposite manner - as one value increases, the other decreases. 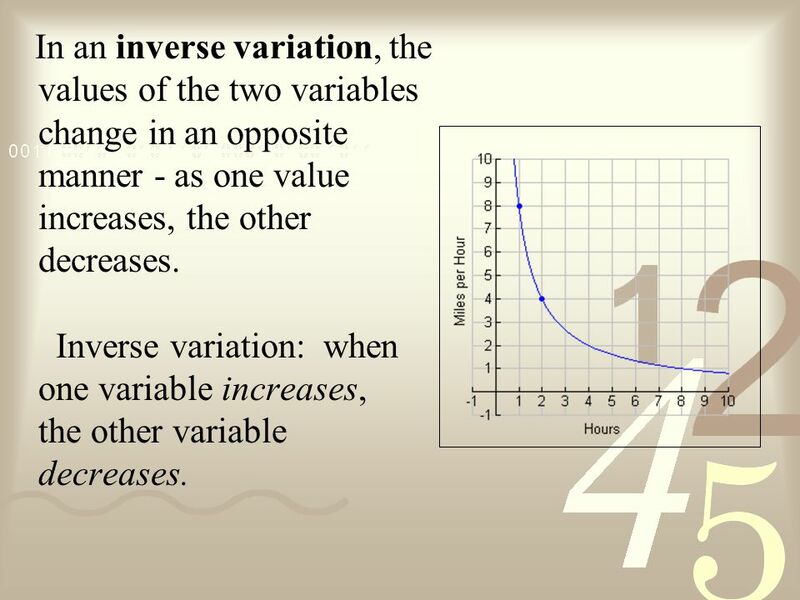 Inverse variation: when one variable increases, the other variable decreases. 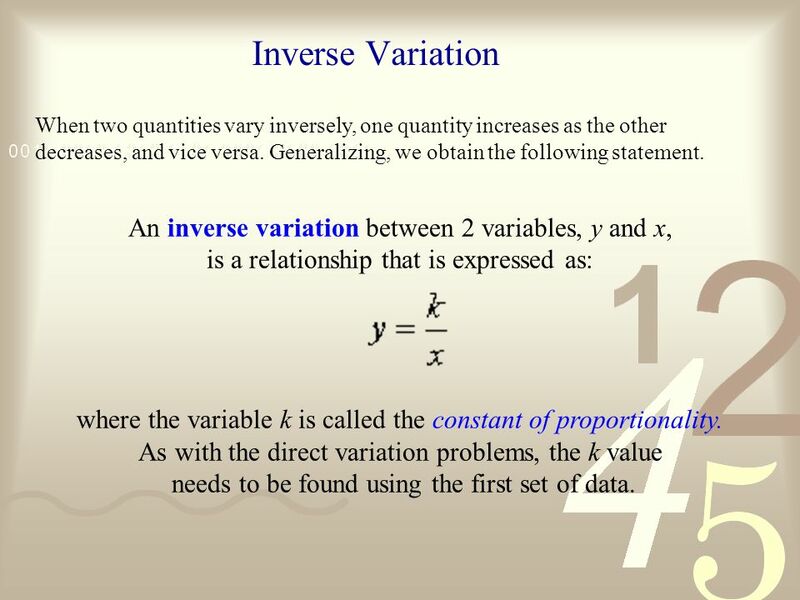 When two quantities vary inversely, one quantity increases as the other decreases, and vice versa. Generalizing, we obtain the following statement. 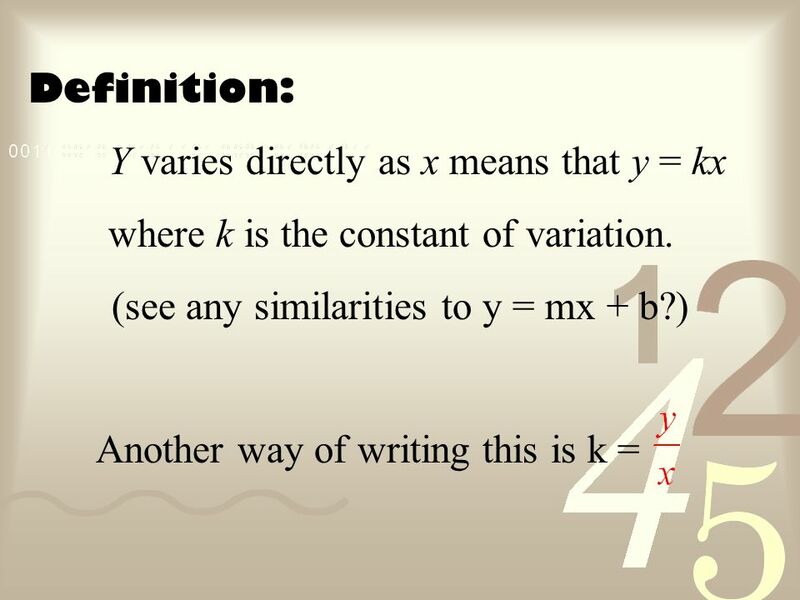 An inverse variation between 2 variables, y and x, is a relationship that is expressed as: where the variable k is called the constant of proportionality. 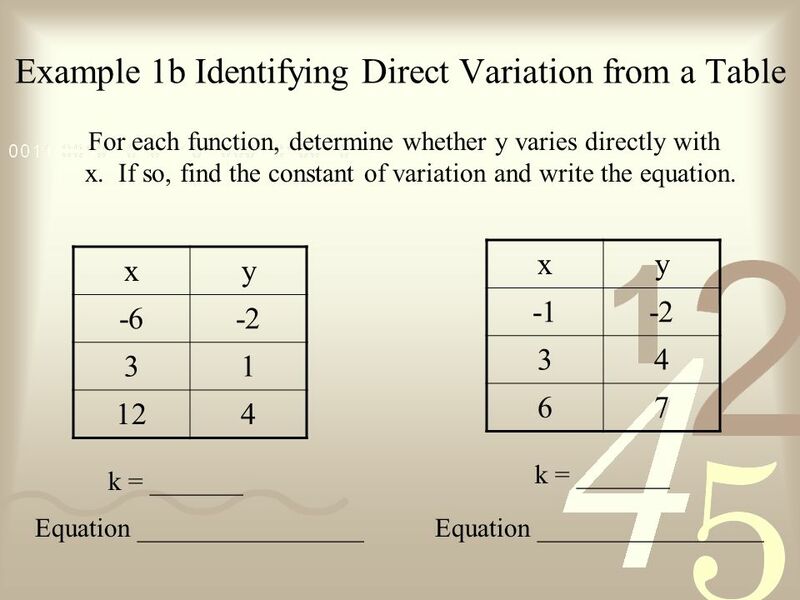 As with the direct variation problems, the k value needs to be found using the first set of data. 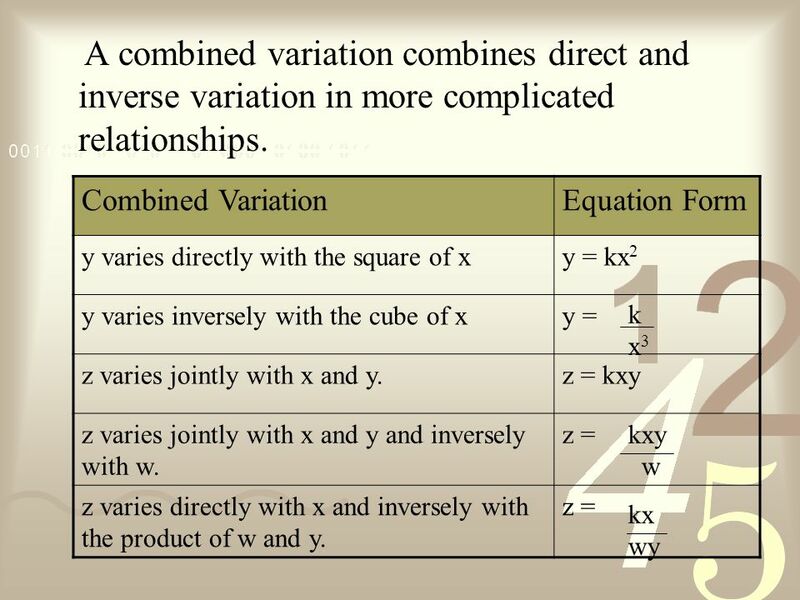 17 A combined variation combines direct and inverse variation in more complicated relationships. 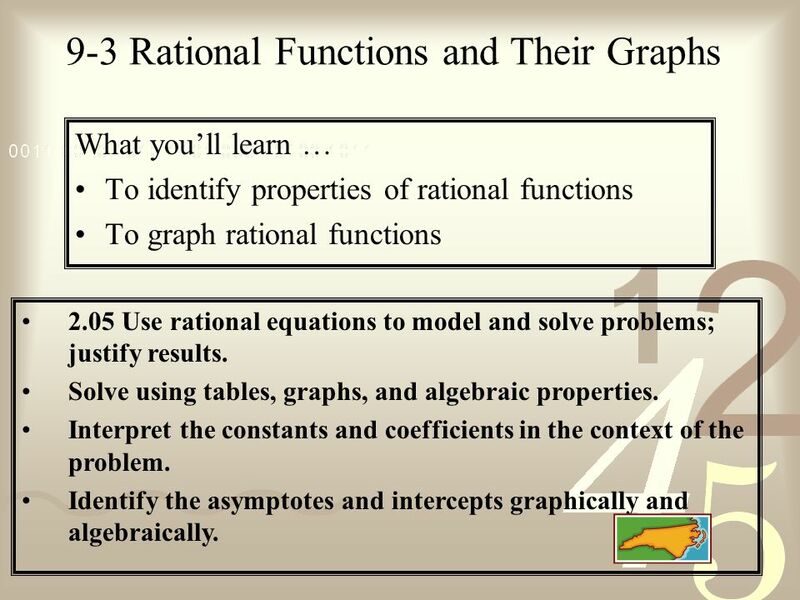 What you’ll learn … To identify properties of rational functions To graph rational functions 2.05 Use rational equations to model and solve problems; justify results. 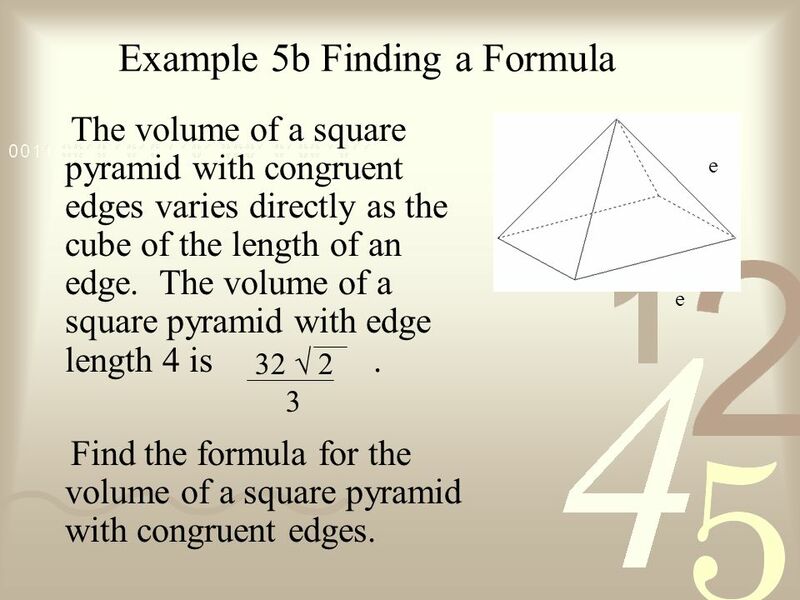 Solve using tables, graphs, and algebraic properties. 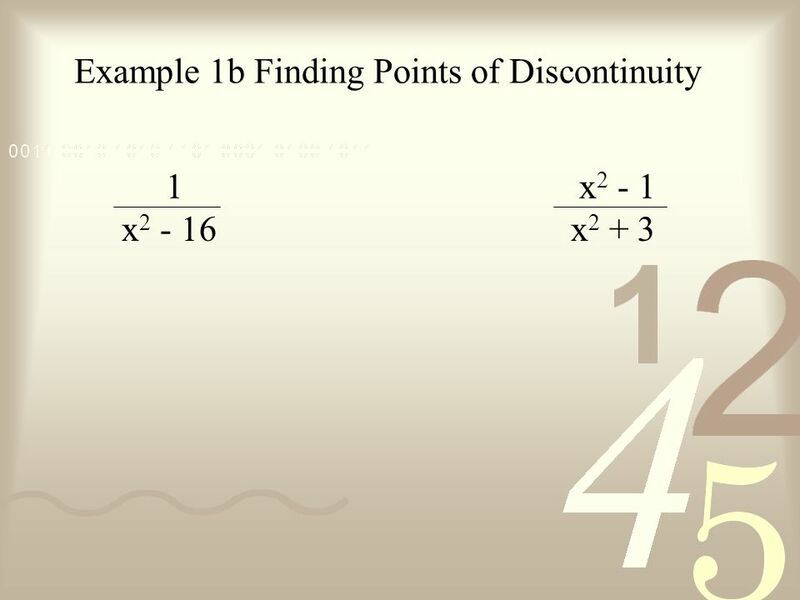 Interpret the constants and coefficients in the context of the problem. 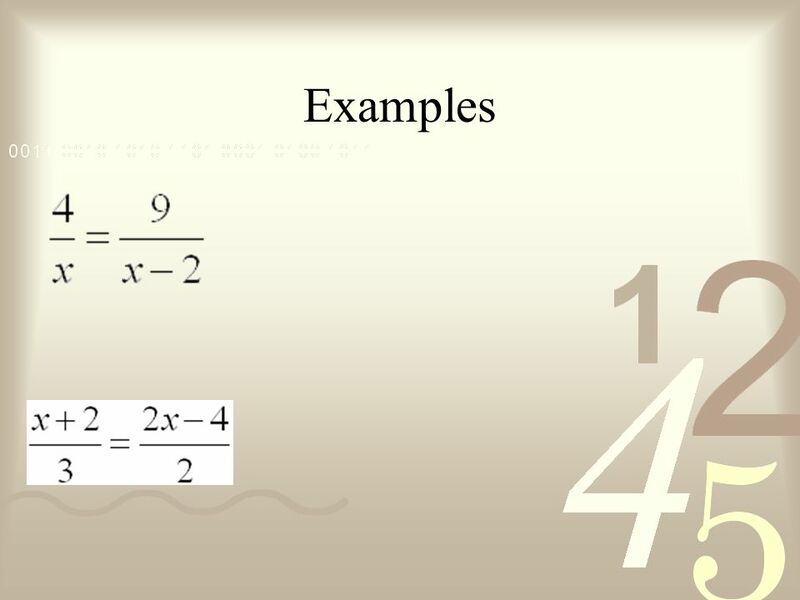 Identify the asymptotes and intercepts graphically and algebraically. 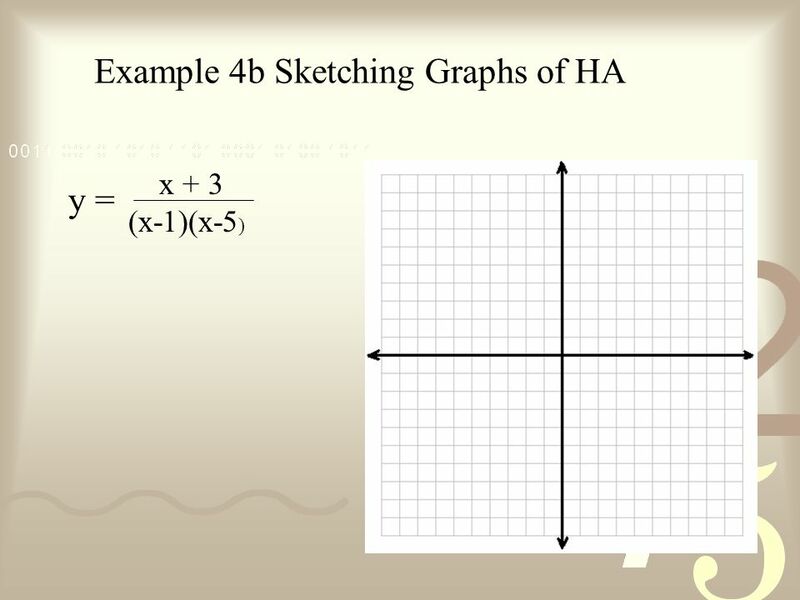 y = In this graph, there is no value of x that makes the denominator 0. The graph is continuous because it has no jumps, breaks, or holes in it. It can be drawn with a pencil that never leaves the paper. 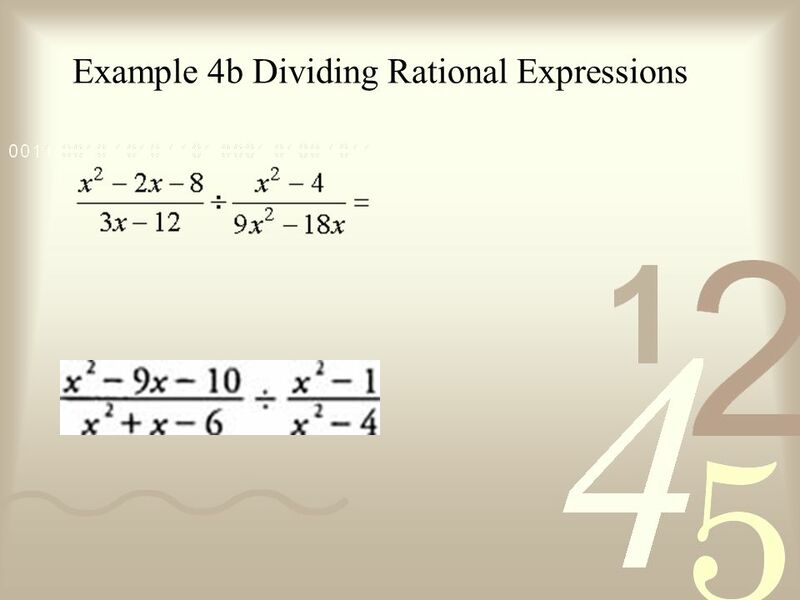 1 x2 - 16 y = In this graph, x cannot be 4 or -4 because then the denominator would equal 0. 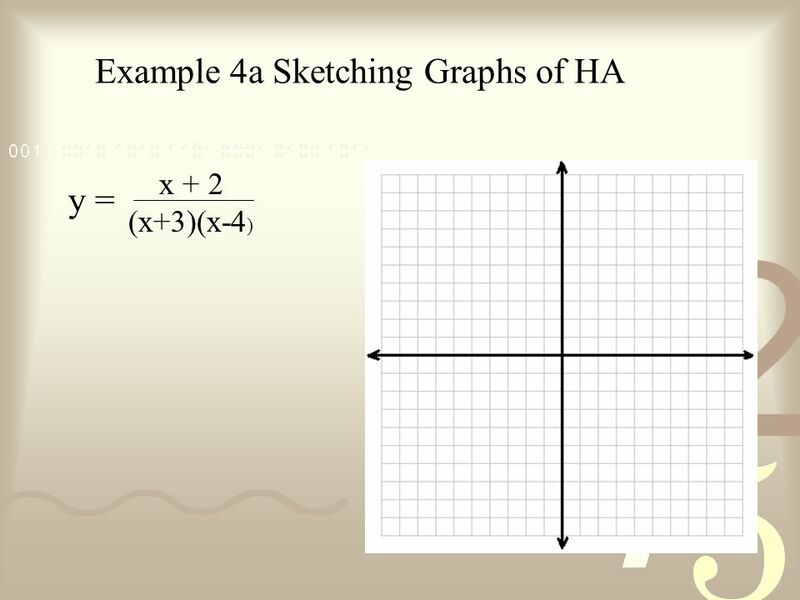 (x+2)(x-1) x - 1 y = In this graph, x cannot equal 1 or the denominator would equal 0. 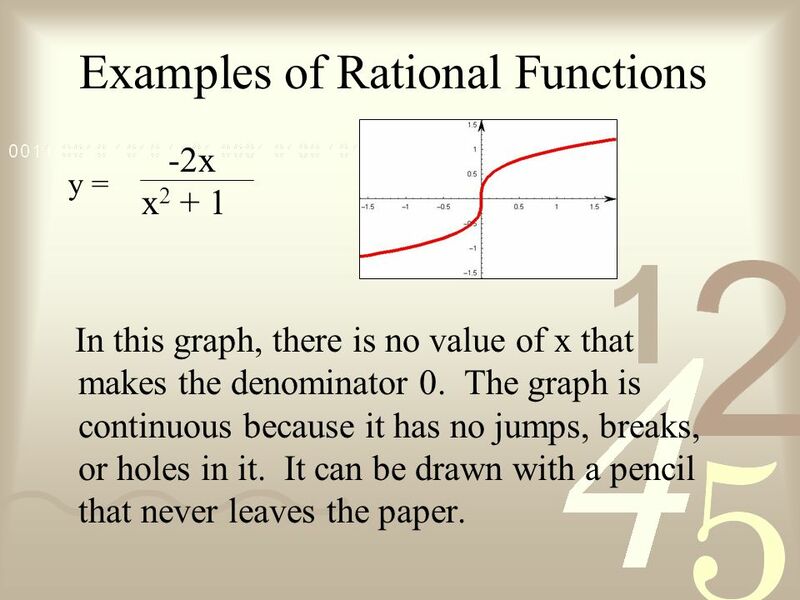 A function is said to have a point of discontinuity at x = a or the graph of the function has a hole at x = a, if the original function is undefined for x = a, whereas the related rational expression of the function in simplest form is defined for x = a. Consider a function . This function is undefined for x = 2. 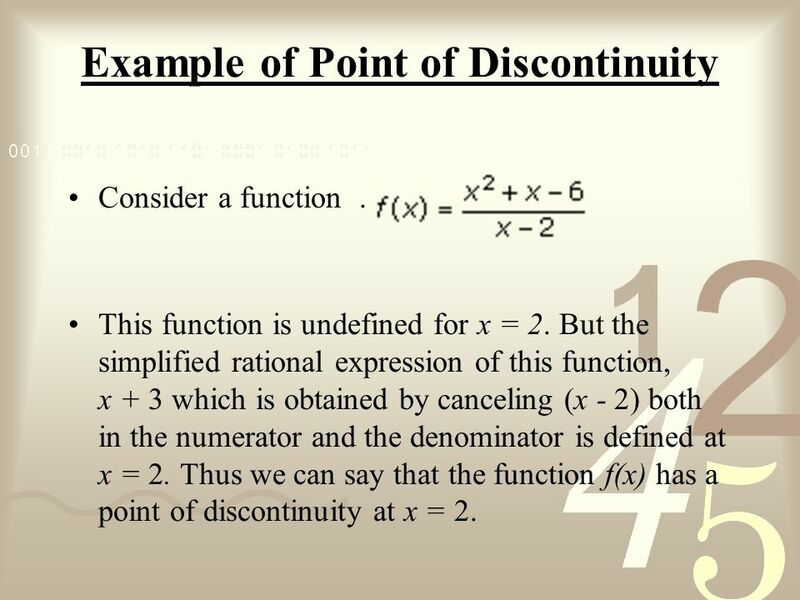 But the simplified rational expression of this function, x + 3 which is obtained by canceling (x - 2) both in the numerator and the denominator is defined at x = 2. 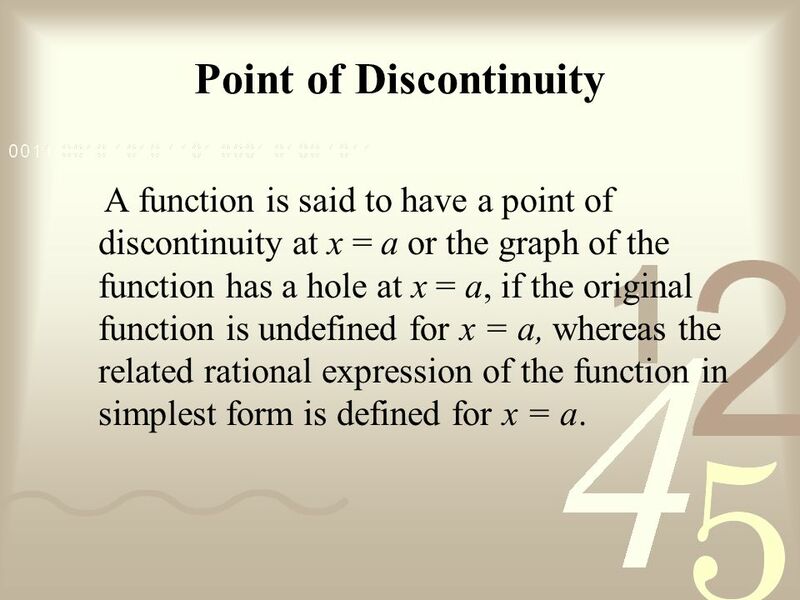 Thus we can say that the function f(x) has a point of discontinuity at x = 2. 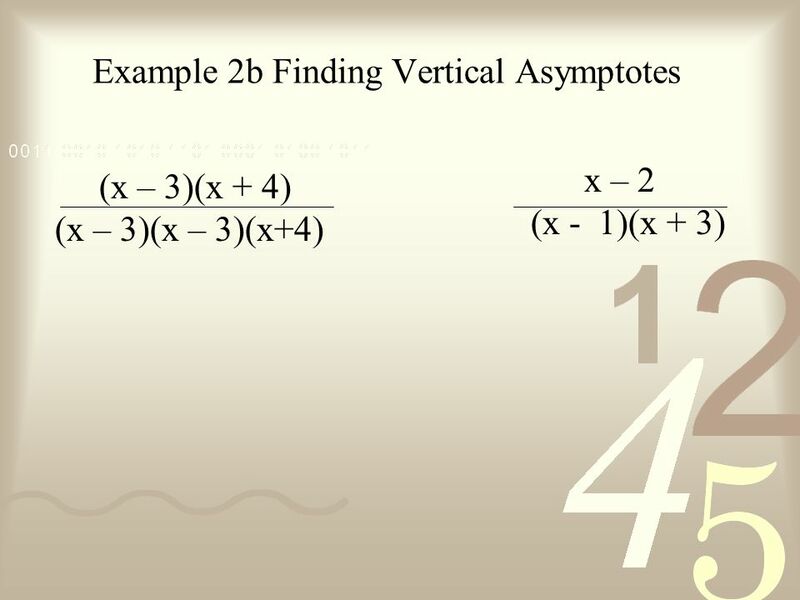 28 Vertical Asymptotes An asymptote is a line that the curve approaches but does not cross. 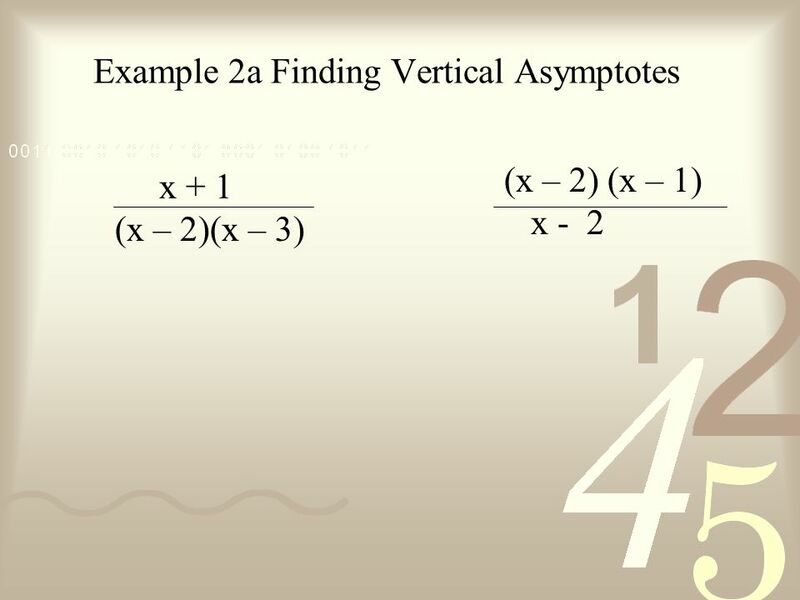 The equations of the vertical asymptotes can be found by finding the roots of q(x). 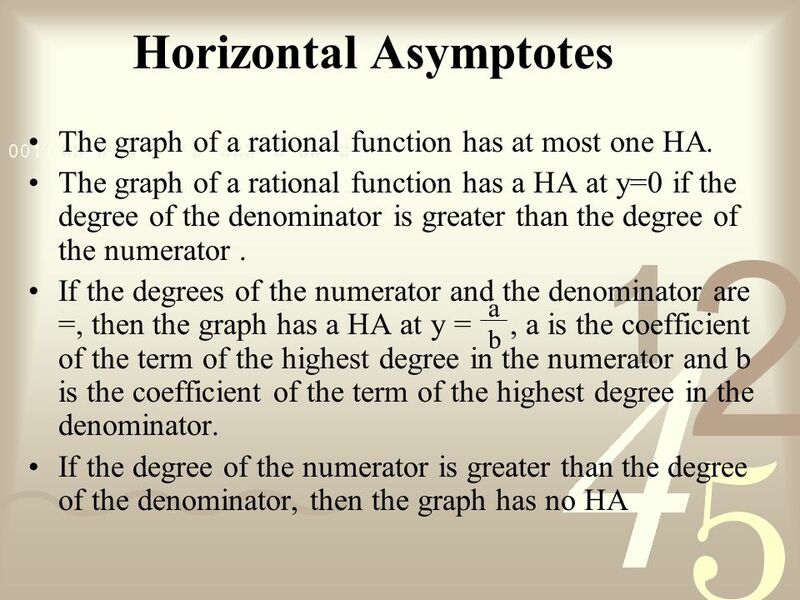 Completely ignore the numerator when looking for vertical asymptotes, only the denominator matters. If you can write it in factored form, then you can tell whether the graph will be asymptotic in the same direction or in different directions by whether the multiplicity is even or odd. 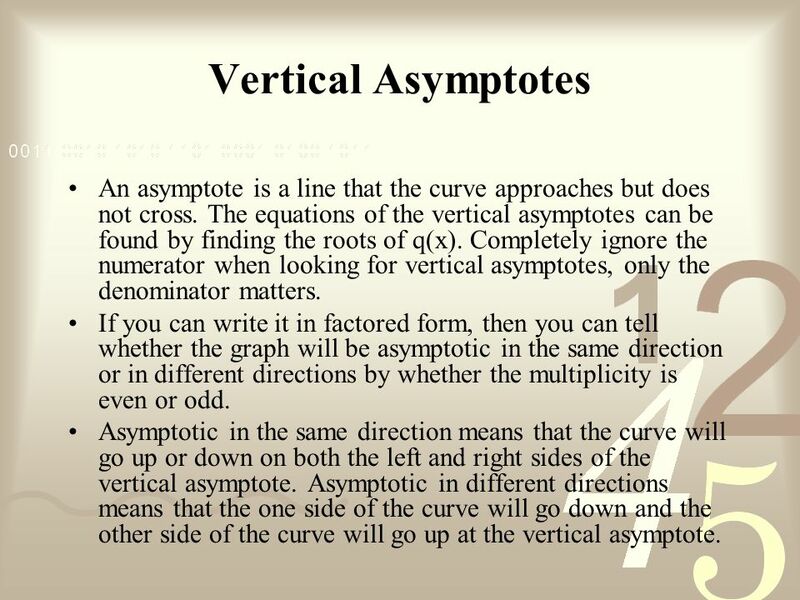 Asymptotic in the same direction means that the curve will go up or down on both the left and right sides of the vertical asymptote. Asymptotic in different directions means that the one side of the curve will go down and the other side of the curve will go up at the vertical asymptote. 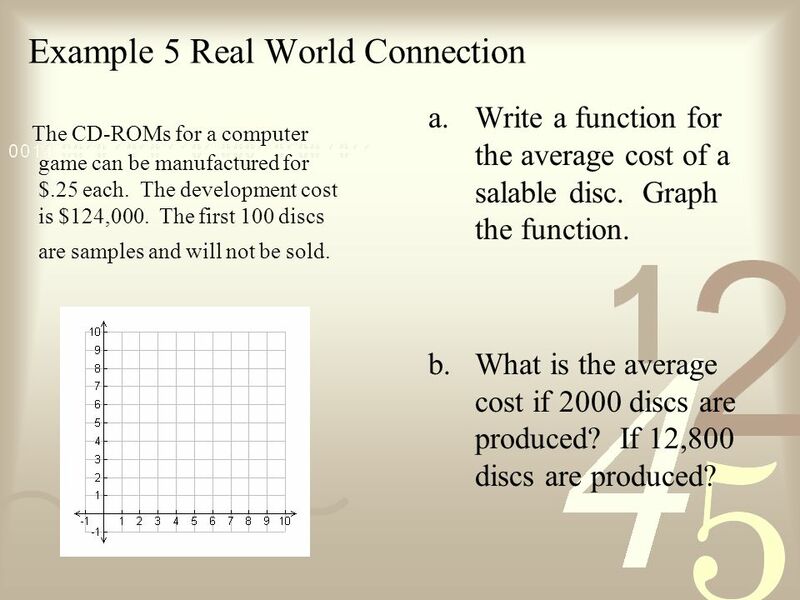 Write a function for the average cost of a salable disc. 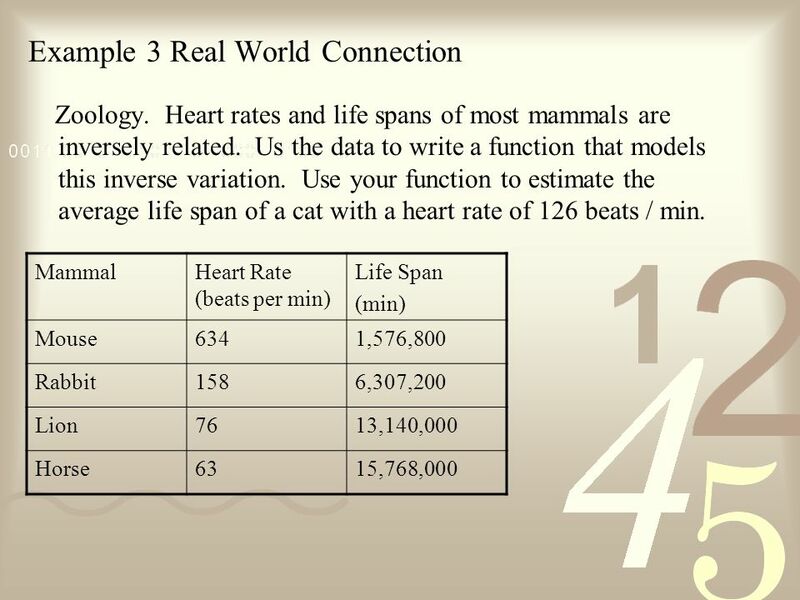 Graph the function. What is the average cost if 2000 discs are produced? If 12,800 discs are produced? The CD-ROMs for a computer game can be manufactured for $.25 each. The development cost is $124,000. The first 100 discs are samples and will not be sold. 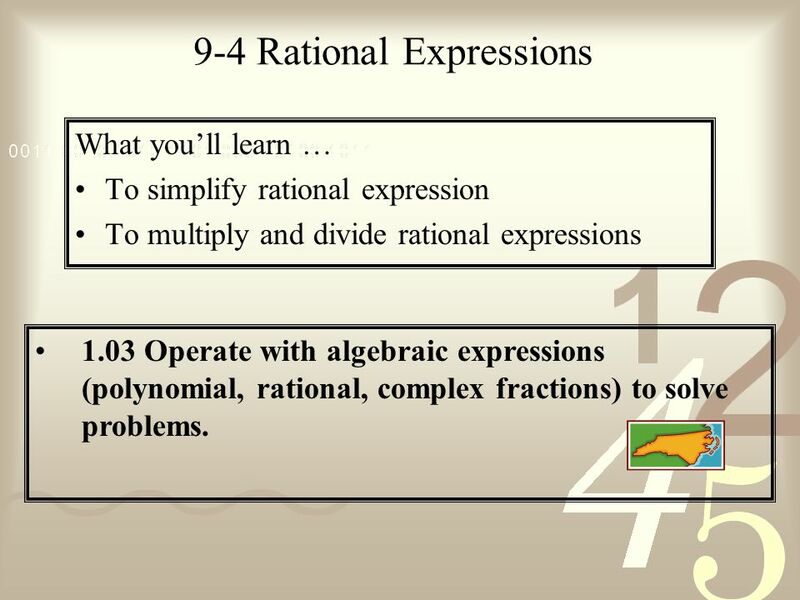 What you’ll learn … To simplify rational expression To multiply and divide rational expressions 1.03 Operate with algebraic expressions (polynomial, rational, complex fractions) to solve problems. 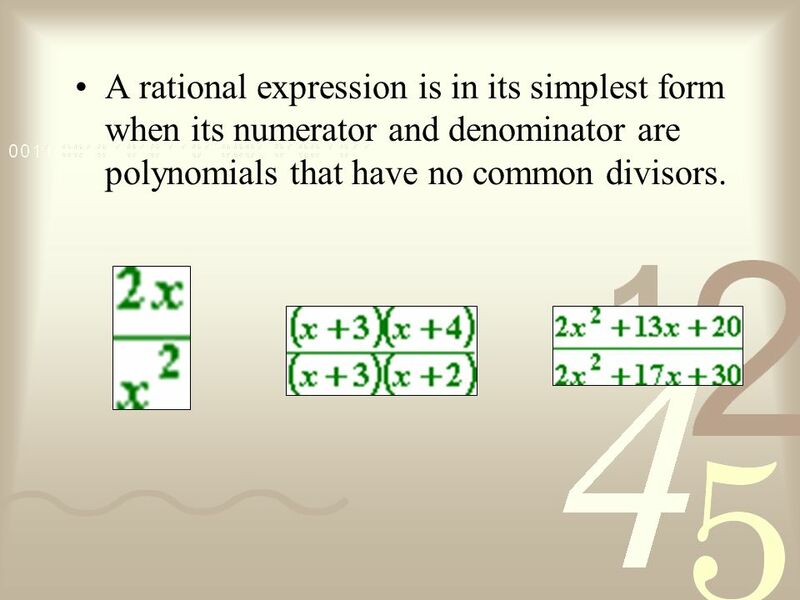 37 A rational expression is in its simplest form when its numerator and denominator are polynomials that have no common divisors. 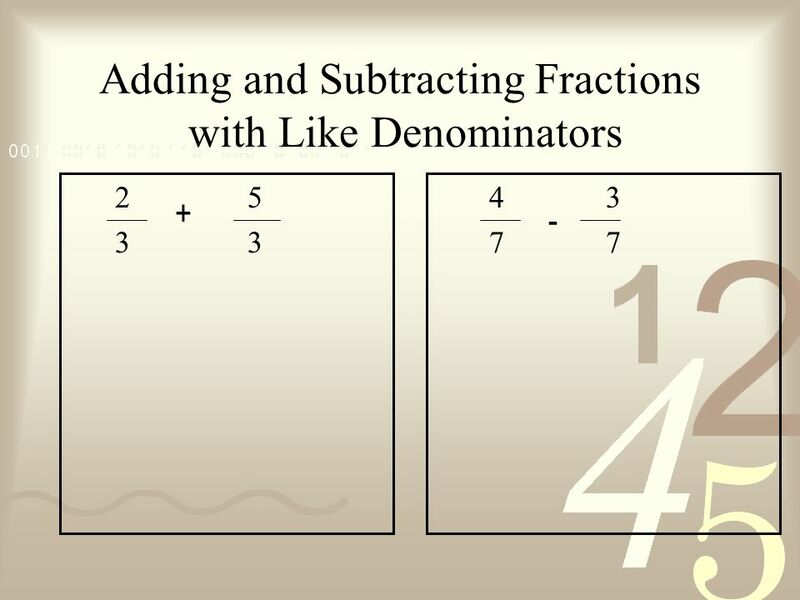 Simply Put: The rule for dividing algebraic fractions is the same as the rule for dividing numerical fractions. 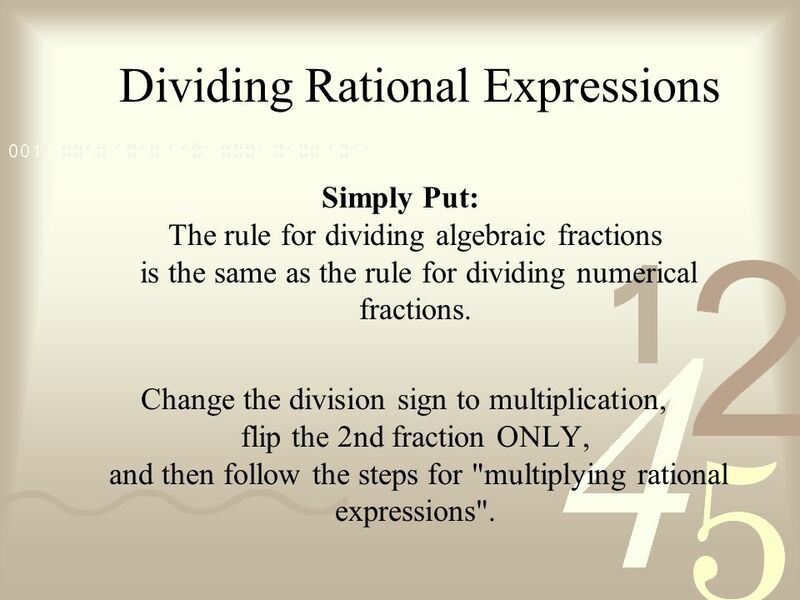 Change the division sign to multiplication, flip the 2nd fraction ONLY, and then follow the steps for "multiplying rational expressions". 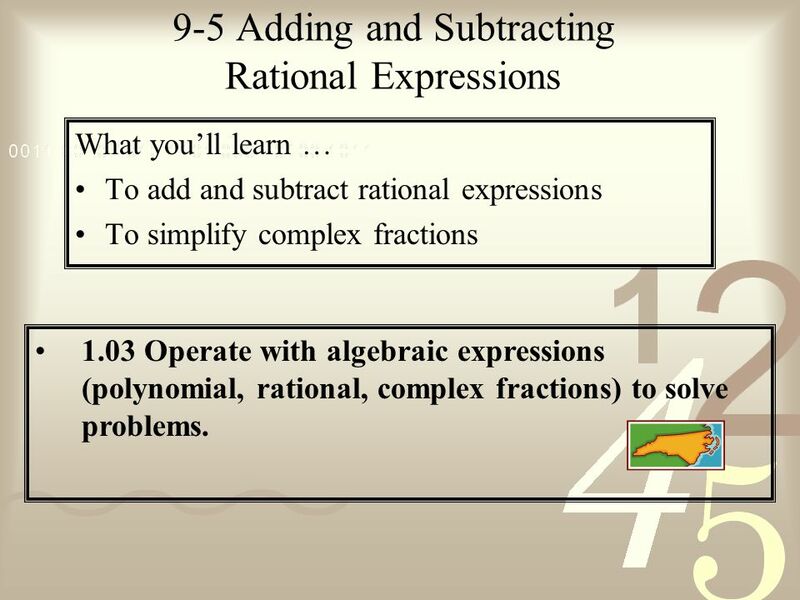 What you’ll learn … To add and subtract rational expressions To simplify complex fractions 1.03 Operate with algebraic expressions (polynomial, rational, complex fractions) to solve problems. 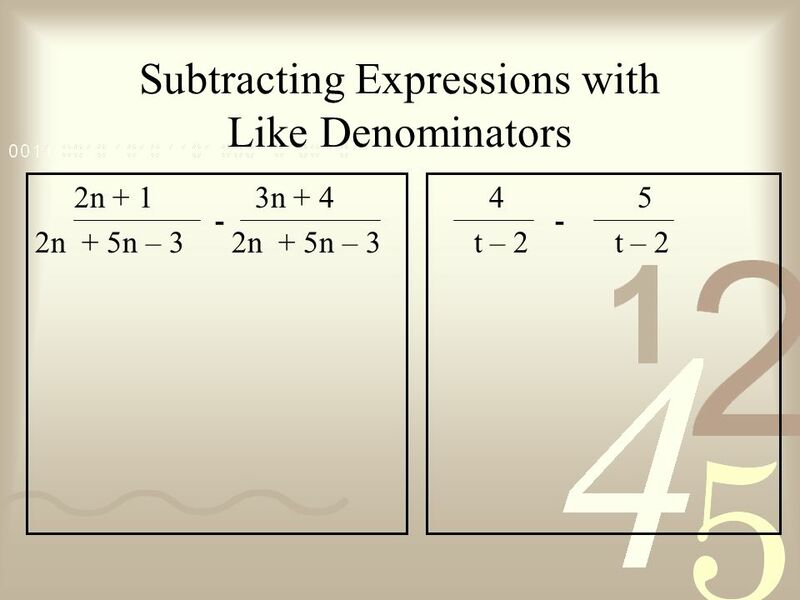 Get a Common Denominator! 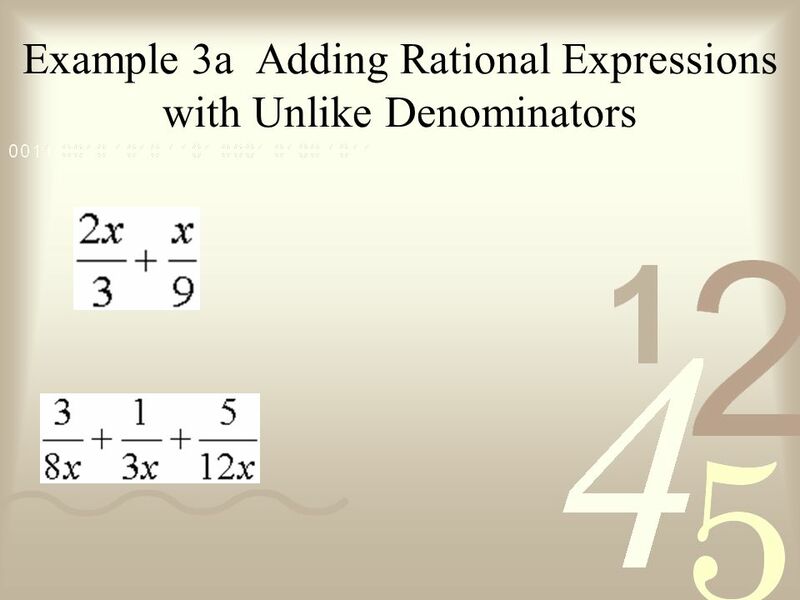 (the smallest number that both denominators can divide into without remainders.) 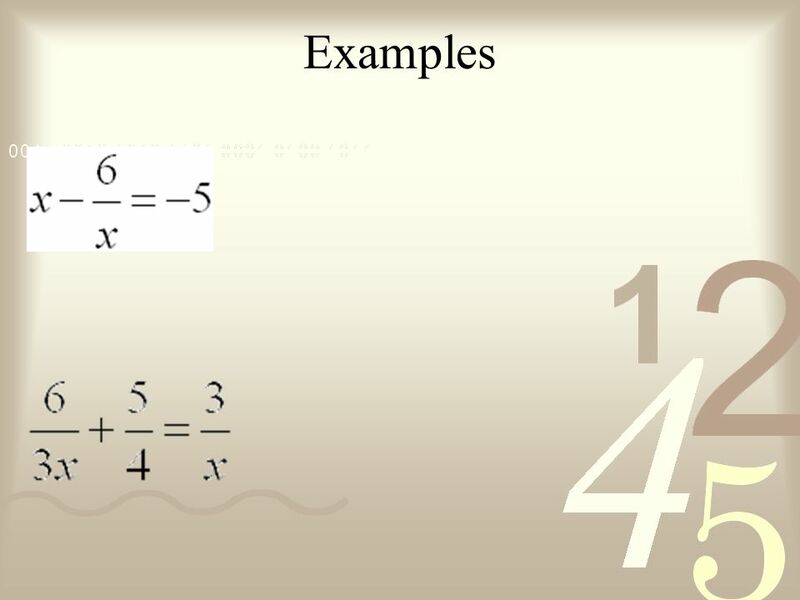 With each fraction, whatever is multiplied times the bottom must ALSO be multiplied times the top. 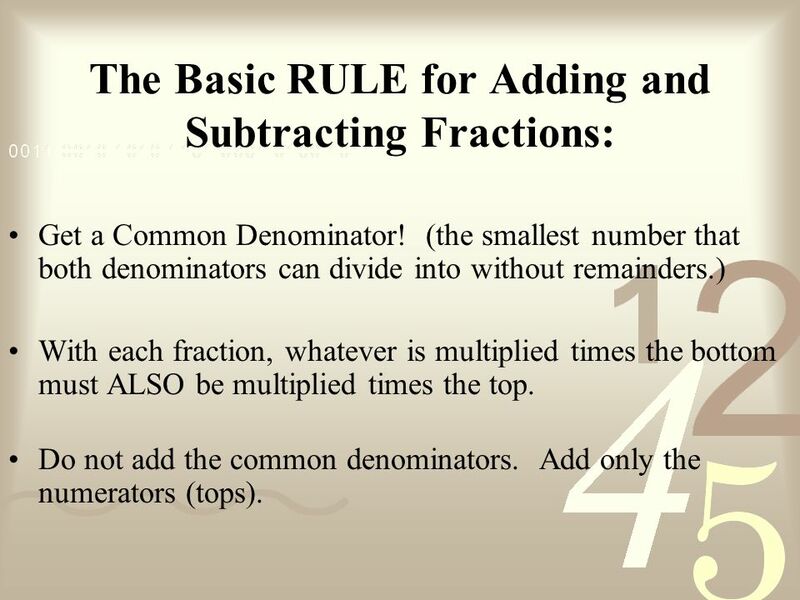 Do not add the common denominators. 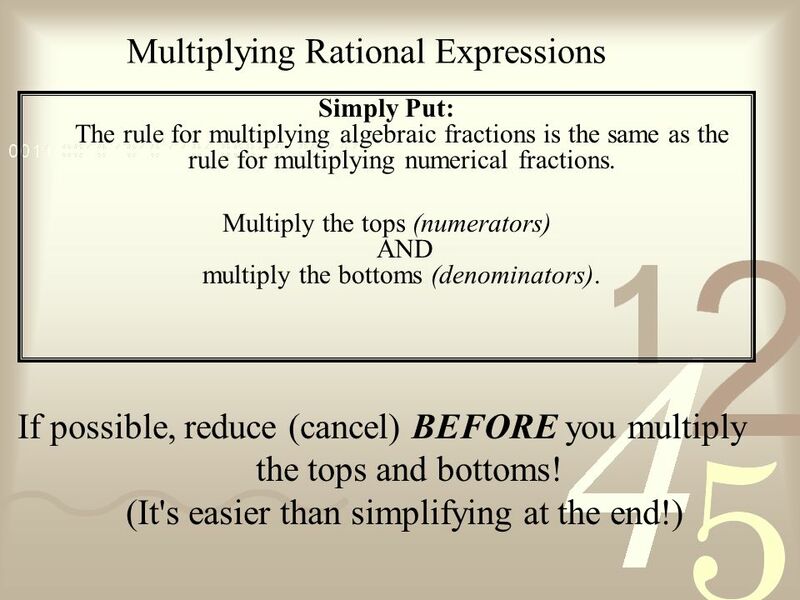 Add only the numerators (tops). 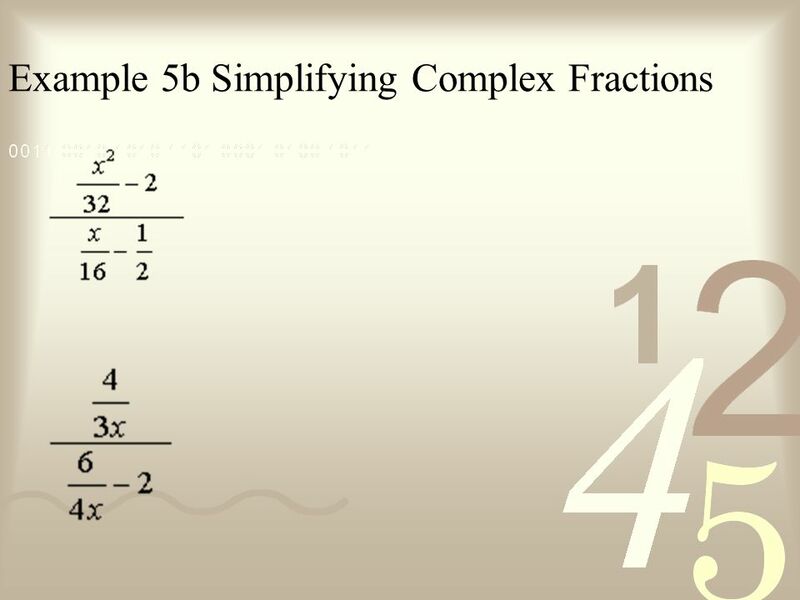 56 A complex fraction is a fraction in which the numerator, denominator, or both, also contain fractions. 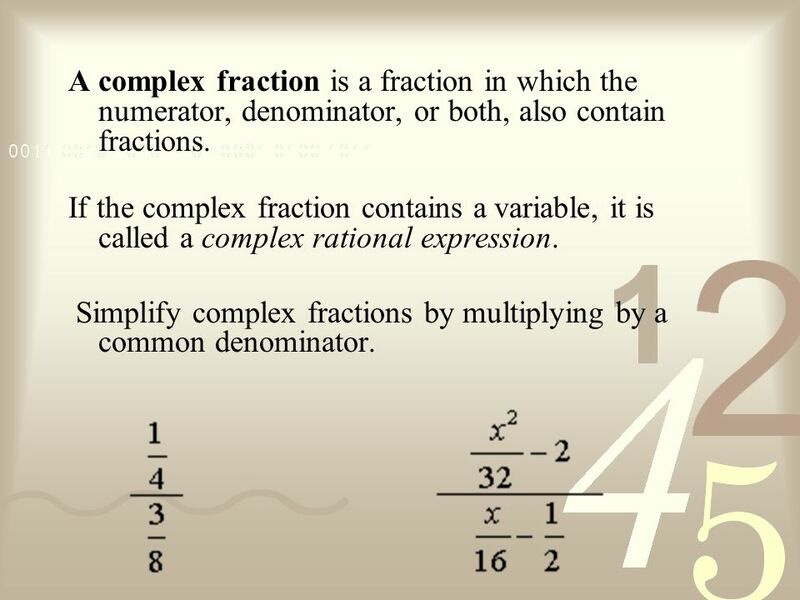 If the complex fraction contains a variable, it is called a complex rational expression. 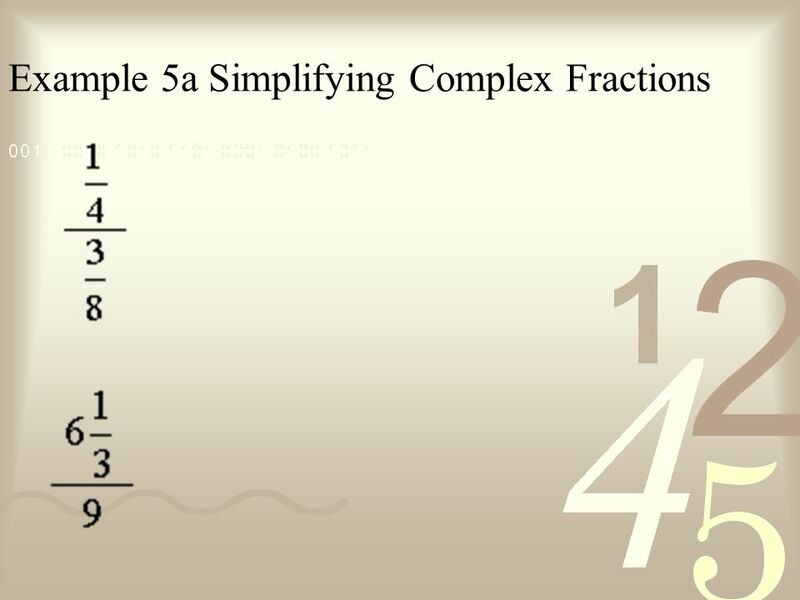 Simplify complex fractions by multiplying by a common denominator. 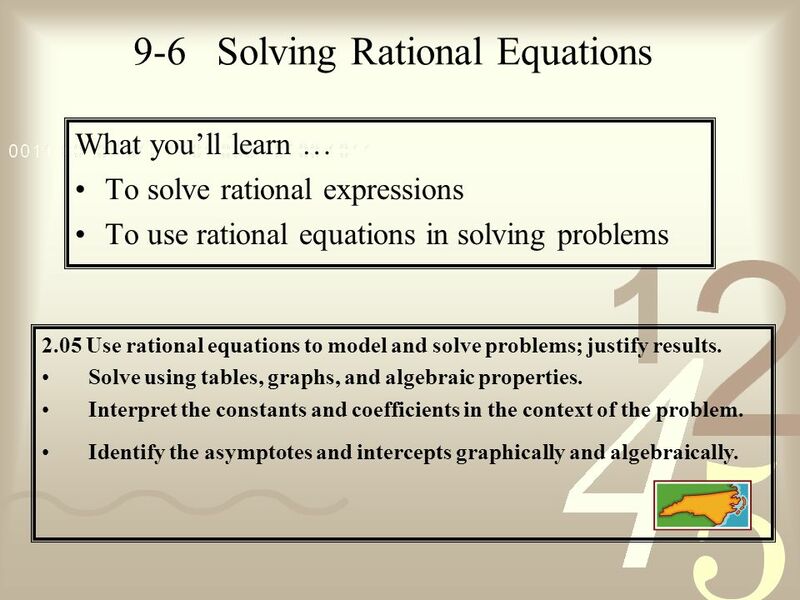 What you’ll learn … To solve rational expressions To use rational equations in solving problems 2.05 Use rational equations to model and solve problems; justify results. 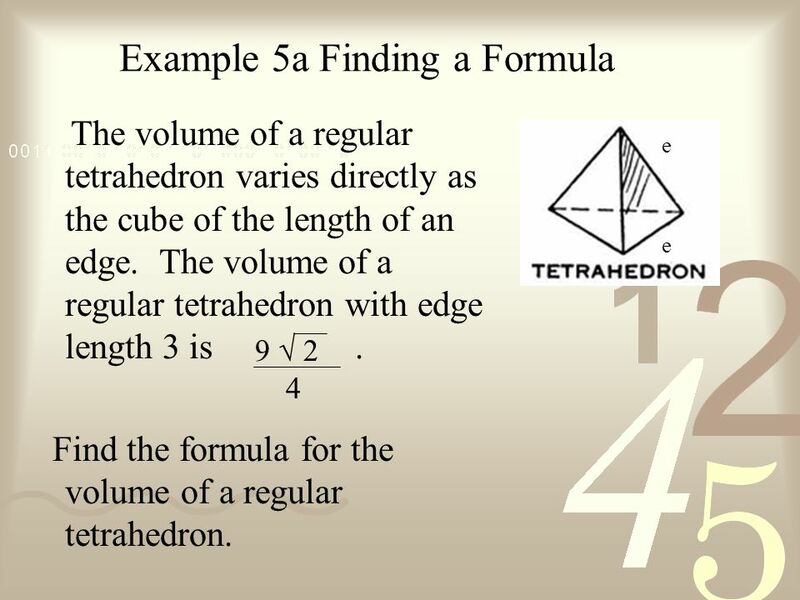 Solve using tables, graphs, and algebraic properties. 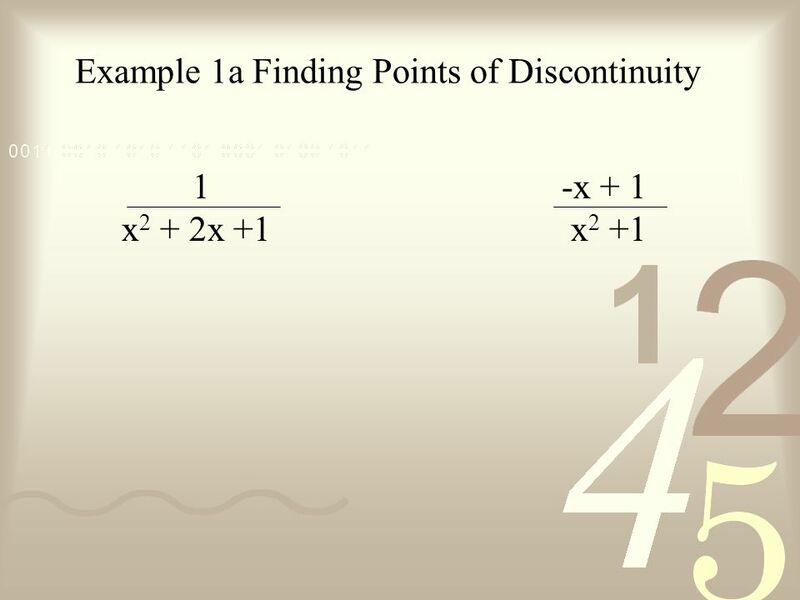 Interpret the constants and coefficients in the context of the problem. 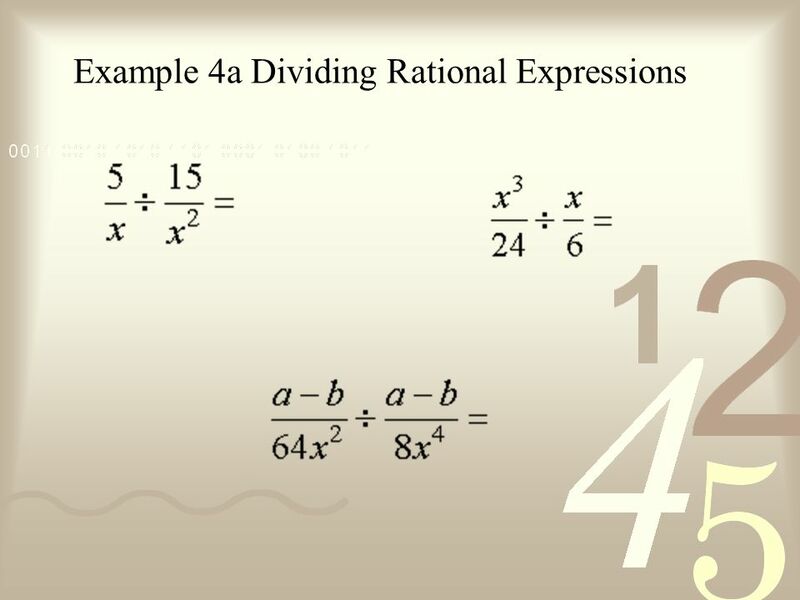 Identify the asymptotes and intercepts graphically and algebraically. 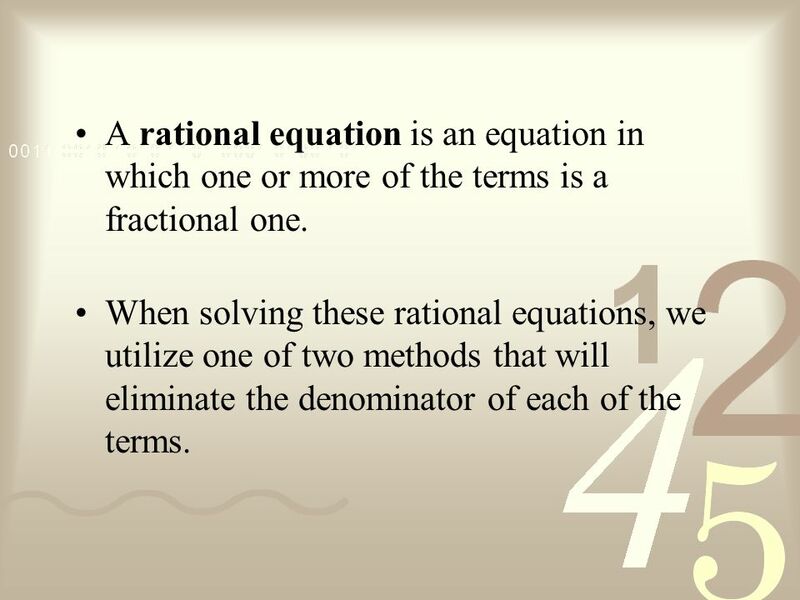 60 A rational equation is an equation in which one or more of the terms is a fractional one. 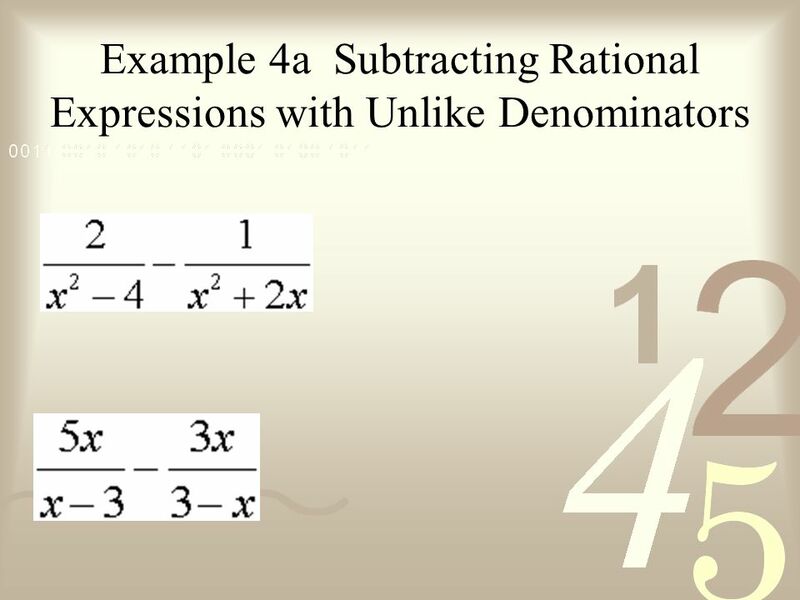 When solving these rational equations, we utilize one of two methods that will eliminate the denominator of each of the terms. 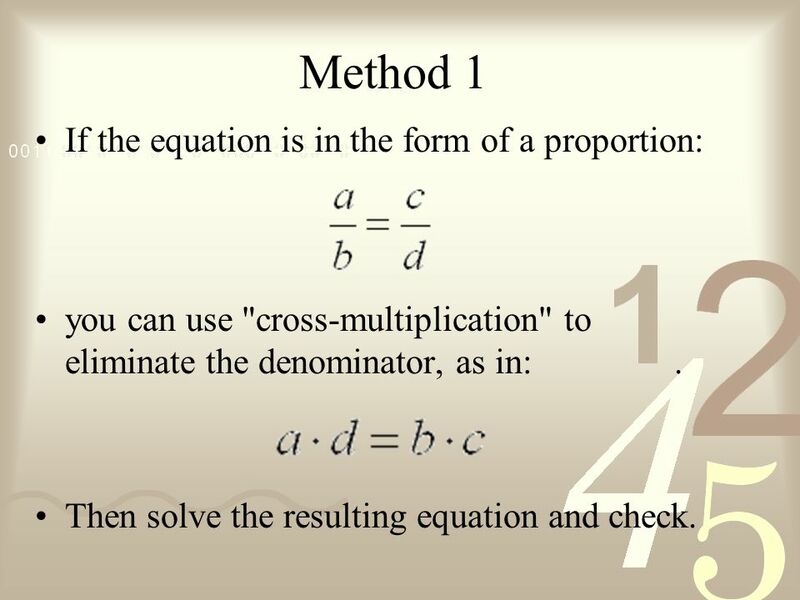 you can use "cross-multiplication" to eliminate the denominator, as in: Then solve the resulting equation and check. 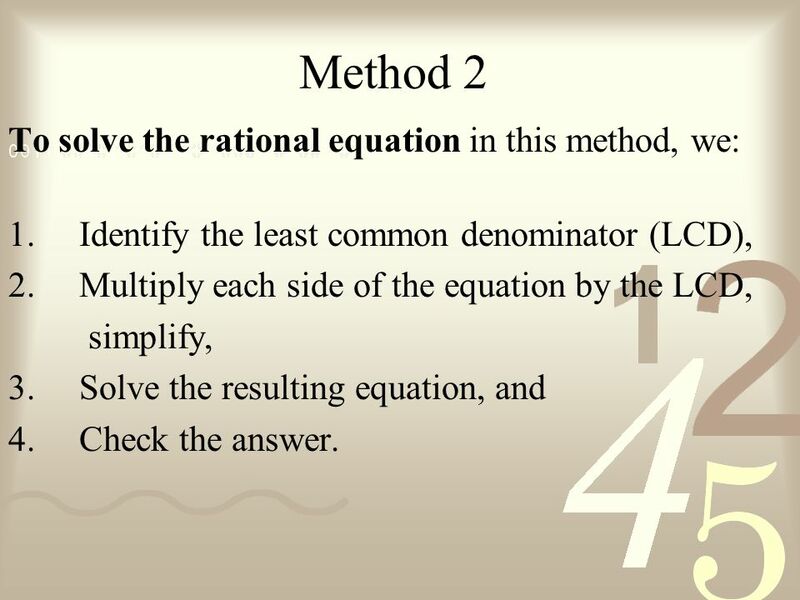 Identify the least common denominator (LCD), Multiply each side of the equation by the LCD, simplify, Solve the resulting equation, and Check the answer. 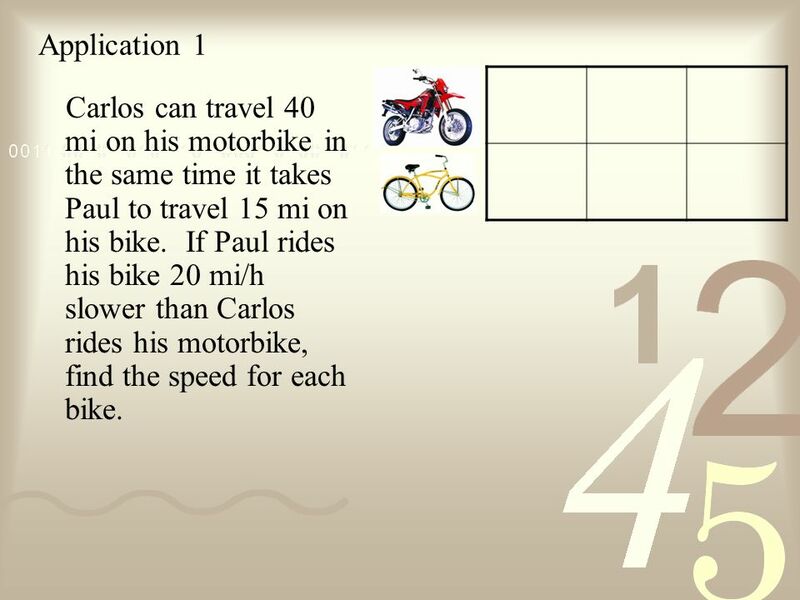 66 Application 1 Carlos can travel 40 mi on his motorbike in the same time it takes Paul to travel 15 mi on his bike. If Paul rides his bike 20 mi/h slower than Carlos rides his motorbike, find the speed for each bike. 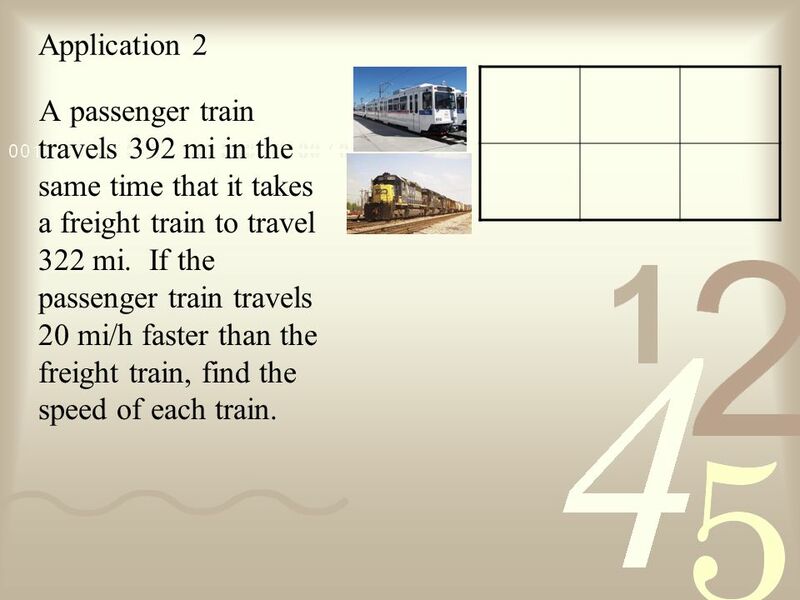 67 Application 2 A passenger train travels 392 mi in the same time that it takes a freight train to travel 322 mi. If the passenger train travels 20 mi/h faster than the freight train, find the speed of each train. 68 Application 3 Sidney can paint a fence in 8 hours. Roy can do it in 4 hours. How long will it take them to do the job if they work together? 69 Application 4 One pump can fill a tank with oil in 4 hours. A second pump can fill the same tank in 3 hours. 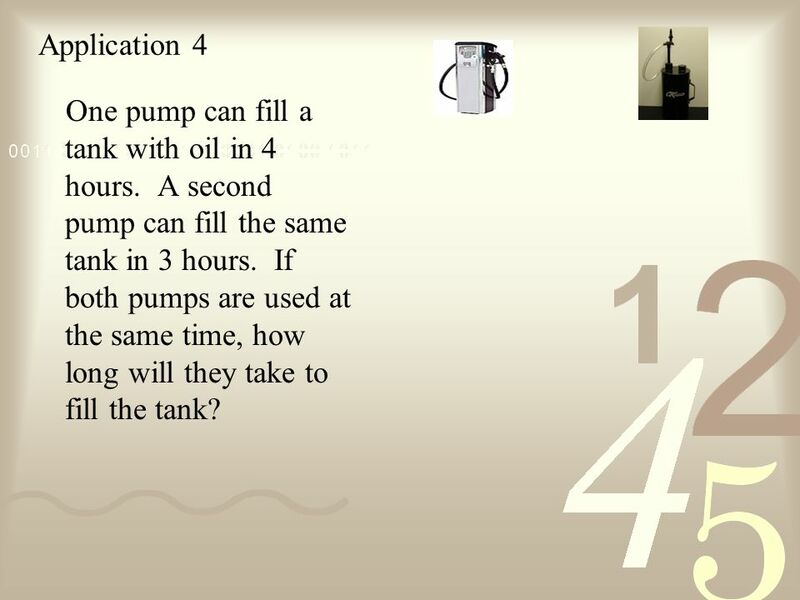 If both pumps are used at the same time, how long will they take to fill the tank? 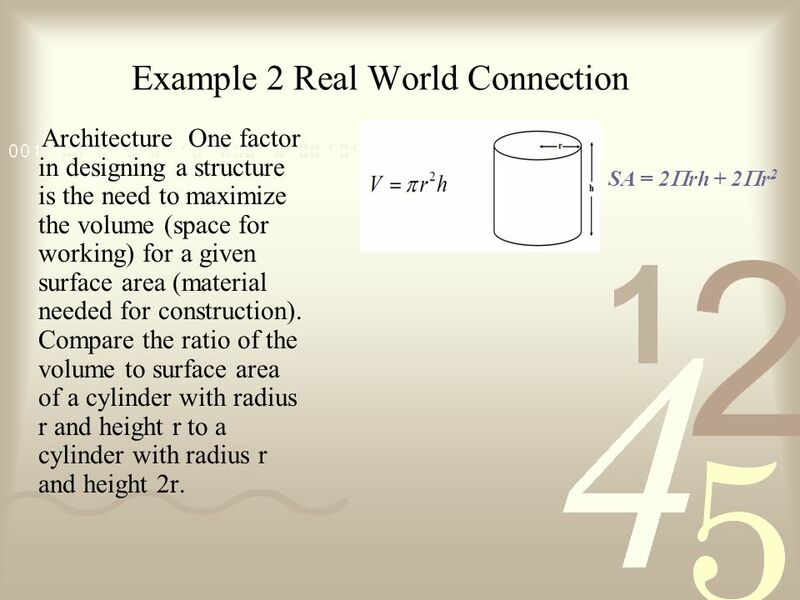 Learned to use inverse variation and the graphs of inverse variations to solve real-world problems. 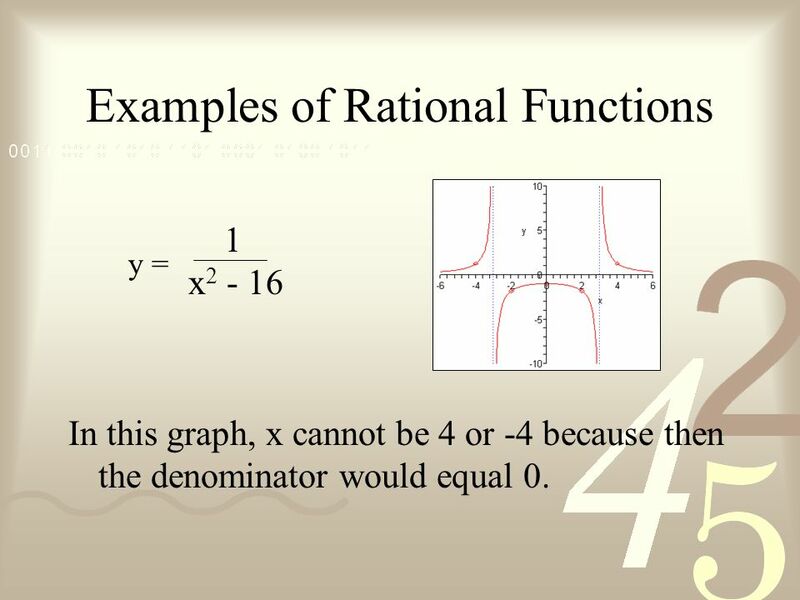 Learned to identify properties of rational functions. 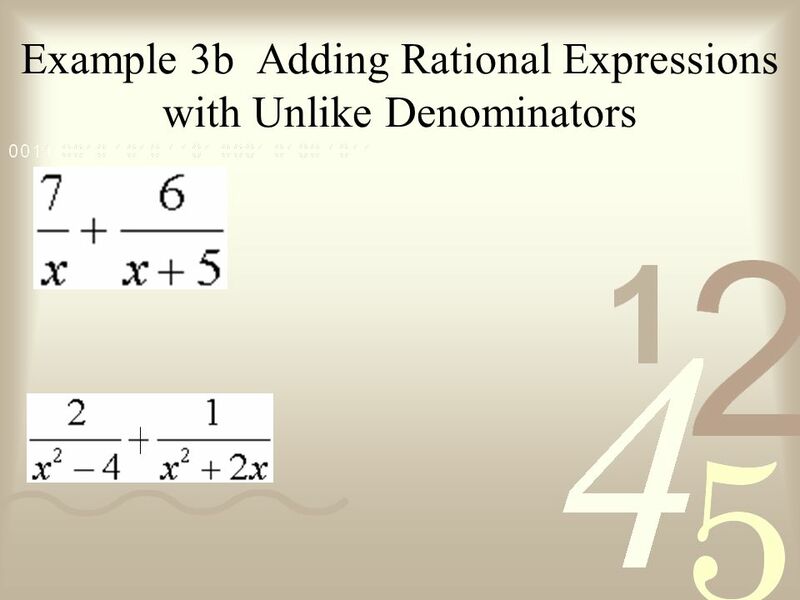 Learned to simplify rational expressions and to solve rational equations. 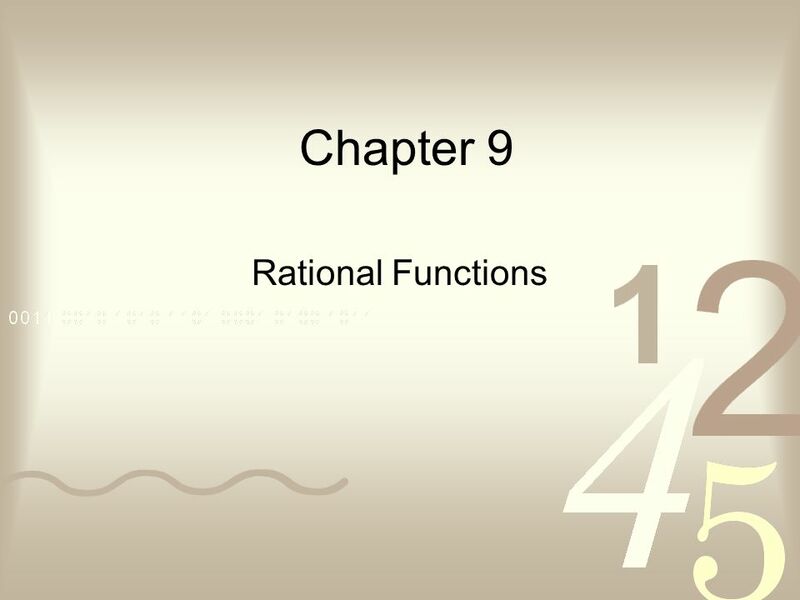 Download ppt "Chapter 9 Rational Functions." 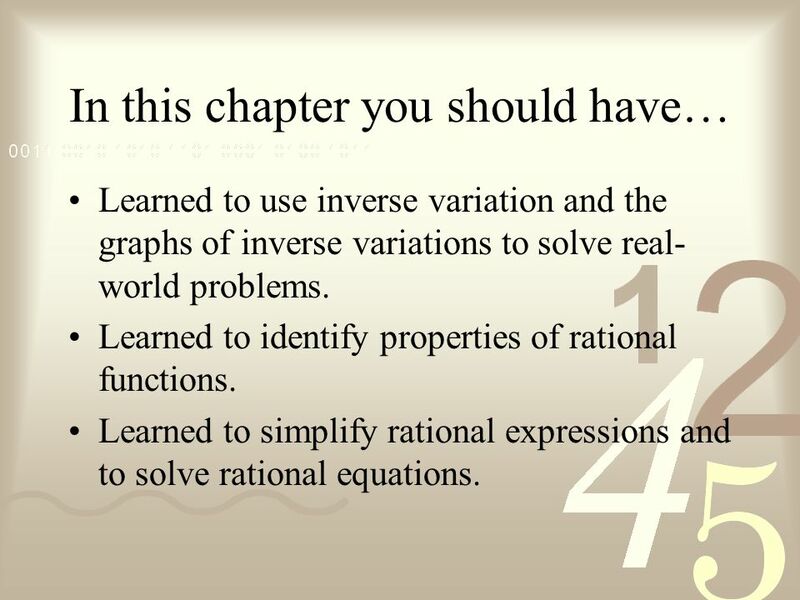 Chapter 0 Review of Algebra. 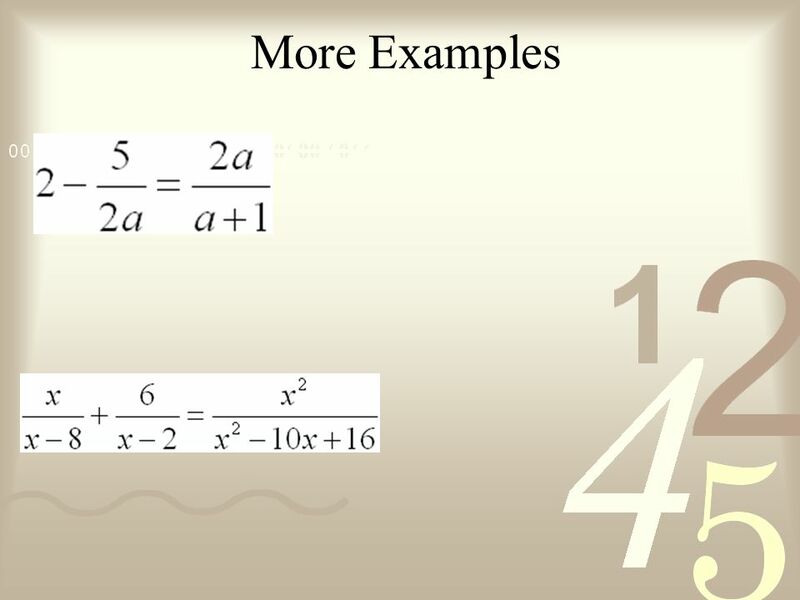 Chapter 1 Tools of Algebra. Projectile Motion Example: After the semester is over, Herman discovers that the math department has changed textbooks (again) so the bookstore. 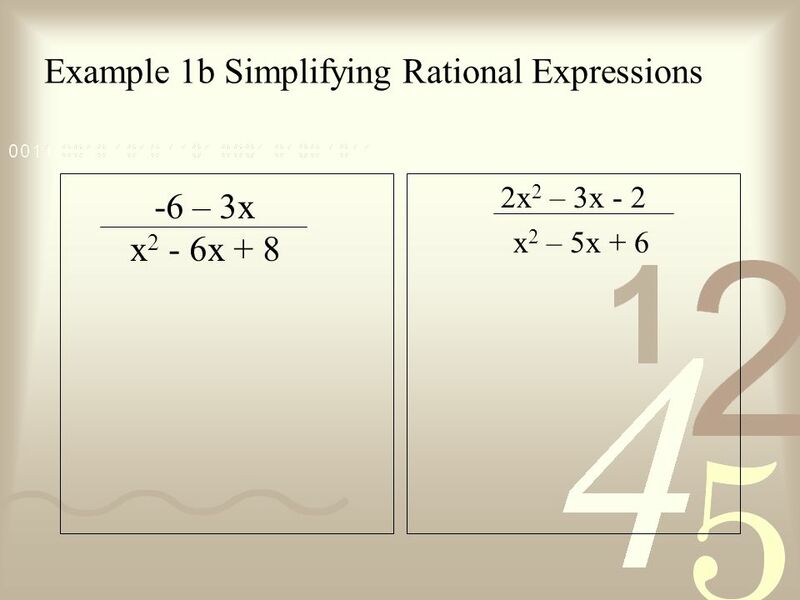 Objective SWBAT simplify rational expressions, add, subtract, multiply, and divide rational expressions and solve rational equations. 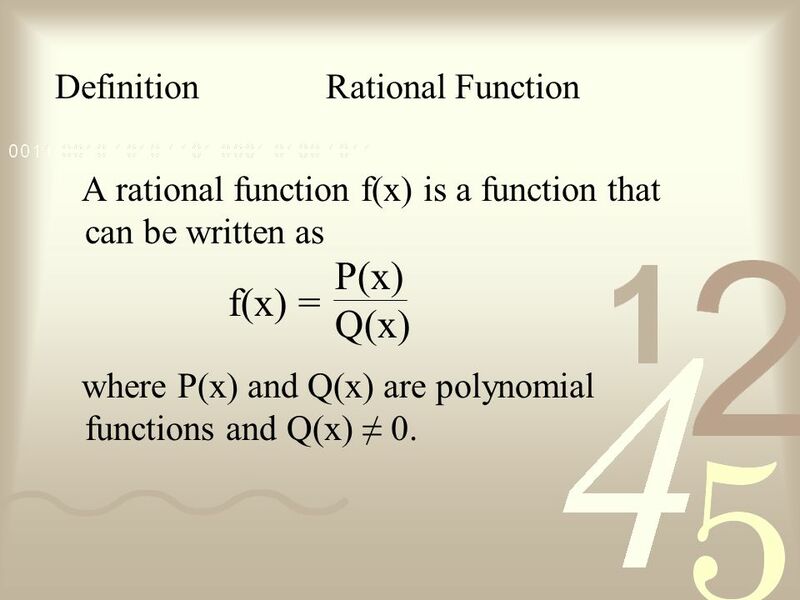 Wednesday, February 26, 2014 Algebra 2 GT Objective: We will continue to explore rational functions, including higher order polynomials, all types of asymptotes.